Retirement Investing Today: Where is the economic recovery? I keep hearing in the news about how fragile the economic recovery is that we are currently seeing. I don’t know about you but I don’t see any economic recovery. What I am currently seeing is nothing more than a mirage that has been caused by massive fiscal stimulus by governments borrowing money (or as I like to think of it, stealing money from the future generations) that they didn’t have or worse by printing money (quantitative easing etc). I am yet to see any evidence that would make me think we are seeing a genuine recovery. Let me look at just one simple example for a minute – US unemployment. Firstly, a quick history lesson. Using data available from the Bureau of Labour Statistics unemployment during the great depression reached a peak of 24.9% in 1933. Now you might say that US unemployment is currently nowhere near that level and is only 9.7% today. However, over the years government has changed the way it measures unemployment. I’m quite a cynical person so I would say they have done this to make the data seem better than it really is. I’m sure the official line is different to this. Today though, people who are too discouraged to look for work are no longer included in the figures. 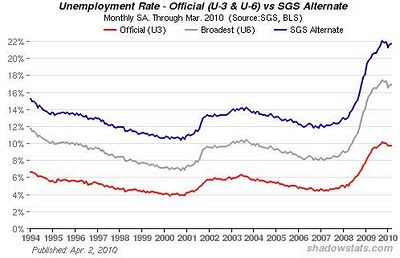 Shadowstats however tries to measure these people to calculate real levels of unemployment by adding them to U-6 unemployment (the official figures are U-3). The results of all of this are shown in my image today which comes from the Shadowstats website. What I see is unemployment of 21.7% which is only 13% down on the great depressions figures above. I also see the latest data trending upwards meaning unemployment is getting worse not better. Where is the economic recovery in that? Governments around the world have now just about maxed out the “credit card”. Back in the UK the government and for that matter the opposing parties also have all agreed that after the election cuts will have to be made to spending. I think just about every member of the public today know the level of borrowing today is just not sustainable. The argument only seems to be how big the cuts need to be. Given that in my opinion this is all that is keeping the economy propped up it’s going to be very interesting to see if this supposed recovery is sustainable. Have you seen any evidence of genuine economic recovery?